It's autumn and I love the fact that summer is over!! Here in Australia even autumn can be very hot (for my poor Dutch body) and I am looking forward to the shorter and colder days. Do you know the phrase: "you don't know what you've got 'till it's gone"? It's true! I'm talking about a proper autumn and winter! Back home in the Netherlands I loathed the cold. Autumn was generally rainy and windy, which is not very nice when you have to go everywhere by bike! Winter wasn't nice either if you had to go outside. Especially when the snow starts melting and becomes black and sloppy and yukkie! I fell off my bike straight into the wet snow more than once. However, after more than 5 years in Australia, I miss the things that I thought I hated before. The cosyness for which the Dutch have a unique word, 'gezelligheid' is lacking in Australia, although sometimes they try really really hard. I miss this so much!! Autumn and winter in Australia cannot compare, at all. Of course not all is bad, there are some positives to autumn and winter here, but it is definitely not like home. When the weather gets colder, I try to cook food which is a bit heavier. I'm not much of a beach person anyway and rather spend my time inside than outside, so a few extra calories do not worry me. 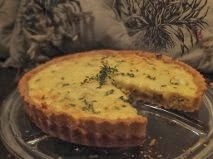 When I saw this tart by Jennifer from Delicious Everyday I immediately wanted to make it. It looked delicious and I liked the idea of a wholegrain crust. In the spirit of autumn I tried to make a bit of an autumn background when I took photos. We have some beautiful ikea pillows at home and I thought I'd showcase them in the background. Yes, it may look weird. Don't judge me, I have just started blogging and making pictures so I still have a lot to learn! 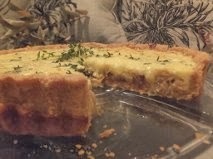 Anyway, the caramelised onion tart. I was looking for something i could quickly reheat for lunch at work. This tart was just the right thing. Bring in a bag of lettuce and some balsamic and your lunch is done! The recipe originally says that you start by making the pastry. I would recommend starting with the onions. Good caramelised onions take more than an hour to make and do not need any balsamic vinegar or sugar. This version uses the quick version. If you don’t have a lot of time, go for the quick version. The onions will not be as sweet and there will be a lot more than when you make the long version, but the balsamic vinegar and the sugar slightly makes up for this. To make the short version, chop the onions in a kitchen machine and heat some oil or butter in a pan. Slowly cook the onions for 15 minutes or so before adding the thyme, balsamic and sugar and cooking for another 5 minutes. To make the long version, do exactly the same but then keep the onions in for more than an hour on low heat. They will break down, start caramelising, and in the end you will have a handful of caramelised onion goodness. I prefer this version – but I get it, we’re all busy, so the quick version will do. Grease a 30 cm loose bottomed tart tin and roll out the pastry. The pastry will easily break and it will be difficult to get it in the tart tin. I always roll it over some aluminium foil and then quickly turn the foil above the tart tin, and slowly remove the pastry from the foil. You will still need to break off some bits and pieces and add some pastry where needed. Refrigerate the tin for 15 minutes. Put some baking paper in the tin and fill with baking weights. Bake for 10 minutes before removing paper and weights and baking another 10 minutes before slightly golden. Set aside to cool. Mix the eggs in a bowl with the egg yolk, the cream, milk and mix with some salt and pepper. Place the onions in the base of the tart and spread out easily. Sprinkle with cheese and then top with the egg mixture and more thyme. Bake for 18 minutes or so until the filling is just set. You can check this by inserting a skewer and if it comes out dry the tart is ready. Serve with leafy salad and balsamic vinegar. I may have done something wrong or used the wrong flour, but I did not enjoy the texture of wholegrain in this tart pastry. It almost 'squeeked' when chewing on it and felt a bit like eating paper. I have therefore suggested replacing the wholemeal flour with plain flour, that may ensure that the pastry melts in your mouth. I have made similar tarts before and they worked our really well. It may just have been the type of flour I used. I would also recommend eating a tiny piece. This tart is heavy and very filling. Not a bad thing as it will give you many tart slices to bring to work for lunch. Enjoy!